Stamping large closures and one-piece body sides for local OEMs has Magna's Mexican operations investing in automation to wring as much productivity from its press lines as possible. A focus on automation, specifically robotic press tending, keeps this Wisconsin metalformer and fabricator in step with worldwide competition. ...and the benefits realized by a lamination stamper: improved corrosion and stain protection, reduced lube consumption, superior quality and elimination of environmental concerns such as excessive mist and operator dermatitis. Two major industry tradeshows, IMTS 2008 and FABTECH & AWS Welding Show introducing METALFORM, recently treated tens of thousands of attendees to the latest and greatest products and services for metalformers, fabricators and tool designers and builders. MetalForming's editors were there to chronicle what's new. Here we present some of those new products. 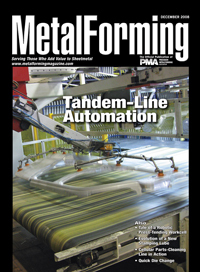 Look for plenty more in future issues of MetalForming. Deep-draw stamper ITW Highland, serving automotive customers as well as valve and appliance manufacturers, complements its inline parts-cleaning operations with a new cellular washer system. Dedicated die-change equipment pays for itself quickly and ensures safe, rapid changeover time after time, and combined with a little ingenuity and elbow grease, can slice changeover by 50 percent or more.